How do you choose the right diet? Between all of the diets and meal plans out there, from low fat to low carb and ketogenic diets, it’s difficult to know which can provide sustainable lifestyle changes. I’m Lisa, and I’ve been there. I tried diets that helped me lose weight, but they weren’t sustainable, and I eventually gained the weight back. Other diets were easy to manage, but they didn’t deliver the results I needed. With the keto diet, and the right support systems and resources, I lost 50 pounds in my first 6 months. More than that, I’ve been able to keep the weight off without feeling like I’m starving myself. Here’s how I did it—and how you can join me in living your healthiest, truest self. Throughout my weight-loss journey, I had three goals. Next, I wanted to sustain my weight loss. Lastly, I wanted my journey to be about more than just losing pounds. I wanted a new lifestyle. I was always the person who avoided excess starches, replaced fries with veggies, and ordered burgers without the bun. I was confident substitution was the right approach. But, I wasn’t feeling any better about my weight. So, in 2012, I decided to adopt a low carb diet. I didn’t know if it was the right plan for me, but I knew it would be a step in the right direction. On a low carb diet (along with tons of time spent exercising), I lost about 100 pounds. But then, I started to gain the weight back. As I added more and more pounds back on, I realized how unsustainable the low carb diet was for me. Despite making deliberate food choices and spending so much time in the gym, the number on the scale kept climbing. In October of 2017, I saw pictures of myself on social media. I felt embarrassed and disgusted. I wanted a better and healthier life. I wanted to be a better role model and mother to my children, who are also overweight. I wanted to be able to have a more active role in their lives (and in my own). And while I felt incredibly frustrated, I also felt motivated to make a sustainable change. After meeting Bethany and Johnny at a mastermind event for online entrepreneurs and joining their “I Love Keto” Facebook page, I found myself admiring their work and the lifestyle they’d built. So, I decided to try the keto diet—sometimes referred to as the Low Carb, High Fat (LCHF) diet. Bethany and Johnny were so helpful, and they started by explaining the difference between a standard low carb diet and the low carb, high fat diet. A low carb diet is focused on simply eating fewer carbohydrates (without telling you how to replace those calories in a healthy way). The keto diet, on the other hand, is about optimizing your metabolic state so that your body uses fat for fuel. As soon as I understood this critical difference, I was ready to begin my keto journey. When the scale says you weigh 312 pounds, you try every diet known to man. Oftentimes, a few weeks into a new diet, I would realize that it couldn’t become a sustainable part of the lifestyle that I wanted. In the meantime (between being frustrated and starting new diets), my weight would dramatically rise and fall. My body was tired of the ever-changing routine. And I was mentally exhausted by my ongoing search for a long-term weight-loss solution. Mostly, I was tired of failing. As a person who has always struggled with maintaining weight-loss, it doesn’t shock me that my success on the low carb diet was only temporary. Having tried the Atkins diet in the early 2000’s, I am familiar with the joy of weight loss and the ensuing disappointment when it isn’t a lifestyle that you can maintain. Low carb diets, including Atkins and Paleo, are unclear about macros—are fats and proteins good, bad or something to avoid? Without clear guidance, dieters like me were left to fill in the gaps ourselves. And in an effort to keep my carb count low, I was turning to too many processed foods and proteins. Being on the Atkins diet wasn’t ideal for my body either—I always had cravings and headaches. I also learned how harmful trying so many diets can be to your overall health. This destructive pattern is known as yo-yo dieting. Yo-yo dieting refers to a cyclical loss and then gain of weight. This pattern of weight-loss and weight-gain can lead to the loss of muscle mass, negatively impact metabolic response, and even take a toll on mental health. I experienced the side effects of yo-yo dieting. Physically, I was exhausted. Bouncing from diet to diet shocked my body, making me feel sluggish. I also had intense food cravings, to the point that they were impacting my daily routine. Mentally, I felt incapable and defeated. I was failing at my weight loss goals, had horrible self-esteem and body image issues, and felt like I was on the brink of giving up. It’s safe to say that I was looking for something different—a lifestyle change that was sustainable, would help me to lose weight, and make me feel good. I was making changes to my diet and exercise routine, but didn’t see weight-loss results that I could maintain. And while it may seem obvious in hindsight, this realization came to me over a period of time, and after a few specific instances. The first painful realization came when I attended an event with my close group of friends. After a fun night out, they posted photos online, and I was disgusted. How had I let myself get that big? In 2011, I gave birth to my daughter, at which time I weighed 312 pounds—my highest weight ever. These events prompted me to adopt the low carb diet. I’d heard good things, and it seemed like a change I could stick to. Over the next 18 months I lost 100 pounds! But, it wasn’t easy. And, as I came to realize, it wasn’t something I could sustain. During this time, I worked out during every spare moment, even teaching Spinning and Zumba. But, I was always exhausted. And, even more concerning, I started gaining back the weight. Then, in October of 2017, things started looking up. I was introduced to Bethany and Johnny Gonzalez at a business event, and was immediately drawn to them. They have magnetic personalities, are very approachable, and carry a positivity that’s contagious. So, weighing in at about 250 pounds, I decided to start a ketogenic diet. What attracted me to keto was that I could eat delicious, satisfying foods and still lose weight. Some of my favorite foods, which the low carb diet made me avoid—like meat, avocados, eggs, and butter—were foods I could enjoy on the keto diet. Inspired by their upbeat approach to a healthy lifestyle, I started following Bethany and Johnny on social media (specifically, their I Love Keto Facebook page). Not only did I find some amazing keto resources and recipes, but I saw that I was part of a much larger movement. I wasn’t alone in my desire for a positive and sustainable lifestyle change. I decided that if keto works, I want to adopt it as a lifestyle. I then set my goal weight at 160 pounds. It’s actually pretty simple: I don’t remember a time when I weighed that much. Or, that little. Now, I am well on my way towards reaching my goal. After my experience with yo-yo dieting, I knew I wanted to learn everything I could before trying another new diet. I didn’t want keto to become a part of my cycle of weight-loss and weight-gain. Knowing I wanted a more sustainable change, I asked Bethany and Johnny to point me to the best resources and information on keto. Both of them were SO helpful! They gave me the names of books to read (like Keto Clarity by Jimmy Moore), as well as a podcast to listen to (Leanne Vogel’s Keto Diet), all of which provided me with in-depth tangible information about eating a low carb, high fat ketogenic diet. Bethany and Johnny also offered their support in other ways. They answered my questions, shared delicious keto recipes, and served as ever-present and positive guides on my journey. One of the first things I learned about was macronutrients, or macros. Macros are the building blocks of nutrition and include carbohydrates, fats, and protein. I learned that metabolically, based on a person’s level of activity, everyone has their own unique macro needs. My precise combination of macros is probably different from yours. A low carb diet didn’t work for me because it was too inconsistent and unguided. I never knew how much protein or fat I should be eating to replace the carbs I’d cut. Whereas the keto diet focuses on a precise macro combination, a low carb diet is truly about only eating fewer carbs. Unfortunately, as Bethany and Johnny shared, many people think they’re on a ketogenic diet when really they’re on a low carb diet. I’ll be honest. At first, I wasn’t so sure that the keto diet was different from the many other diets I had tried. The keto diet offers tons of ways to boost healthy fat intake, helping me to make better and healthier choices in the kitchen. The keto diet sets a moderate amount of protein, making it easy for me to manage and sustain my protein intake. It also offers tons of ways to boost healthy fat intake, helping me to make better and healthier choices in the kitchen. Eating a ketogenic diet is about more than just finding the right macro ratio, though. With Bethany & Johnny’s help, I learned about ketones and how they affect our metabolism and the way we burn energy. Just like macros, measuring and monitoring ketones would be a marker—measurable proof of my progress. You literally can’t go wrong when a plan tells you precisely what to do and what biometrics to track. This new information made me want to adopt keto as a lifestyle. 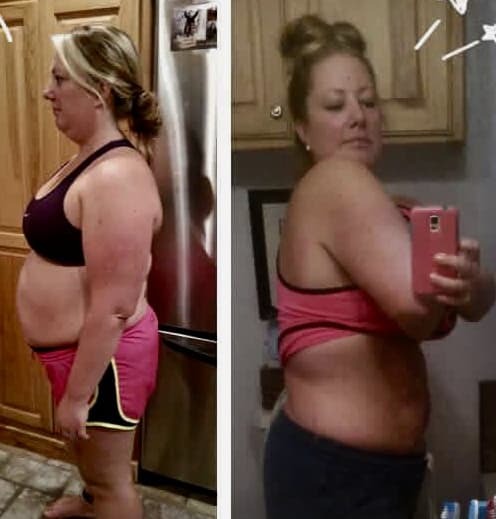 It was the lifestyle change I’d been searching for, and I felt confident I could stick to it while also reaching my weight-loss goal. No other diet could give me that. Armed with all of the new information I had learned about the keto diet, I was ready to redefine and clarify my health and wellness goals. I wanted to weigh 160 pounds. That would mean losing 90 pounds (remember I was 250 pounds when I started the keto diet). This goal meant that I would not only feel better on a daily basis but also reduce my cravings. And, once I set my weight-loss goal, I was able to develop a ketogenic diet plan that would help me get there. When on the low carb diet, I was consuming about 50 grams of carbs per day. In order to get the benefits from the keto diet, I needed to lower that to just 20 grams of carbs per day. And to reach my goals, I wanted to diligently track my progress. Rather than tracking my weight every day, however, as I did with other diets, I decided to casually weigh myself just once a week. I know some dieters prefer to track their weight loss every day (sometimes several times a day). For me, however, stepping on the scale was a source of stress. And stress made me want to over-eat and give into cravings. By reducing “scale days” and focusing on other metrics, like macros and ketones, I was able to hold myself accountable without feeling overwhelmed or defeated. During my time on the keto diet, I noticed that each week I was losing anywhere between 2 and 4 pounds. At the same time, I used ketone urine testing strips to ensure that my body was maintaining ketosis. Ketosis, for anyone who isn’t familiar with the term, is when your body is using ketones to burn fat for energy (instead of carbs). Rather than setting temporary, short-term goals, I sought goals that held me accountable without putting too much pressure on myself week-to-week. Within the first month of adopting the keto diet, I noticed changes. Physically, I felt more energized, experienced fewer cravings, and felt less bloated. My clothes were even fitting better. For the first time in my life, I didn’t have the overwhelming desire to binge eat. After eating a shake for breakfast, I would snack throughout the morning, eating nuts, cottage cheese, wheat thins, and hard-boiled eggs. For lunch, I would have another shake, and snack again through the afternoon. At dinner, I was eating brown rice, accompanied by a protein and a side of vegetables. While I was eating low carb and low fat foods, I was consuming around 2,500 calories per day. With the keto diet, my day looked very different. I had shifted my macros from 20% fat, 50% protein, and 30% carbs to a keto-friendly 70% fat, 25% protein, and just 5% carbs. This change wasn’t as difficult as I had expected. Truth be told, I just looked up approved keto foods and started eating the ones I liked. Almost every day, I start with bulletproof coffee, which carries me through to the afternoon. My first meal typically consists of eggs, bacon, and avocado. In the evening, I enjoy a salad with a protein (vegetables or meat). I eat all of this in an 8-hour window and do not snack. The practice of eating within an 8-hour time frame is called intermittent fasting. And I credit this practice with helping to stabilize my metabolism. On a keto diet, I was eating just 1,500-1,600 calories per day—a significant drop from my low carb diet. And, despite eating less, I actually felt full and satisfied! As successful as my first month eating keto was, it did not come without its challenges. Some days were really difficult. In the first week, especially, I struggled. My body had to adjust since I was no longer fueling it with sugary caffeinated diet drinks. As exhausted as I felt during these first few days, though, my cravings were gone! Going into week 2, many of the changes became easier. I was astonished by how little I needed to eat when I was eating the right things. I quickly learned that social situations are the most difficult. Birthday parties, family gatherings and holidays often involve prepared food. And, I had to learn how to explain the keto diet (and avoid non-keto foods) without offending anyone. When I first started the ketogenic diet, I wasn’t exercising. I wanted to see how the diet affected my body without any outside influence. What amazed me was that even when I wasn’t exercising, I was losing weight on the keto diet. I have just recently started working out again, but I no longer need to spend hours at the gym every day to lose weight. And that meant I had more time and energy to enjoy my new ketogenic lifestyle. Of course, that wasn’t the end of my journey. Before I started the keto diet, I had no interest in tracking my diet. I felt like if I was eating a low carb diet, then I was doing everything I needed to. Besides, it was stressful constantly tracking my weight and keeping a food journal. When I started the keto diet, I wanted to be sure I was hitting my macros and staying in ketosis. How could I keep an eye on biometrics and stay accountable without becoming too stressed or anxious to stick to my new diet plan? I started using My Fitness Pal, a very simple online calorie counter and meal planning resource. Ketone testing strips also made the process even easier. They helped me know if I was staying in ketosis and whether I would need to adjust macros to get the most benefit from my new diet. Being able to track my macros and ketones so easily changed the way that I look at food, and it means that my body is getting exactly what it needs. On a low carb diet, it was too easy to eat too many processed foods or protein. By tracking macros and ketones on the ketogenic diet, it was easy to manage what I ate and adjust my diet when I hit a weight-loss plateau. It was also easier to adjust to common dieting challenges. For example, I paid attention to fluctuating levels of hunger so that I could eat more or adjust the hours I was eating. If I hit points or times of the month when I felt bloated, I could pinpoint which foods were likely causes and make substitutions that worked for my body. And when I have cravings, which are inevitable (though minimal on the keto diet), I can be sure to have a few sweet, keto-friendly options around to satisfy my cravings without over-eating or consuming too many carbs and pulling myself out of ketosis. If I hadn’t been tracking my macros, I wouldn’t have the consistent and sustainable results that I’ve achieved. Instead, I’d probably fall right back into the pattern of yo-yo dieting. I am also constantly experimenting and adjusting my diet while continuing to reach my goals. I think that says a lot about the integrity of the ketogenic diet. Keto vs. Low Carb, Which Diet is Right for You? Adopting a low carb diet isn’t enough. When you want to try a new diet, there are so many things to consider. First and foremost, what are your goals? Adopting and maintaining a healthy lifestyle? It is important to ask yourself these questions so that you can find the diet that is right for you. Low carb diets may provide results at first, but for many dieters who need more direction, they’re ultimately unsustainable. Without clear guidance on what to eat (instead of just what NOT to eat), your body won’t get the energy it needs to function at an optimum level. This imbalance has negative side effects beyond difficulty losing weight, and it’s one of the reasons so many people struggle to succeed on a low carb diet. Since I started the keto diet, I feel the best I have ever felt. This isn’t a restrictive diet that left me combating cravings or feeling constantly hungry. Every day I get to eat some of my favorite foods, all of which provide my body with essential nutrients and satisfy my hunger. Every day I feel amazing, because now I’m giving my body exactly what it needs. While I know the keto diet is right for me, that doesn’t mean it’s right for everyone. Because we all deserve to live the lives we want. If you have questions about the ketogenic (or LCHF) diet, it is important to talk to your doctor, a nutritionist or—better yet—keto experts like Bethany and Johnny. From my research stage and through my keto journey, Bethany and Johnny have been an amazing support system. From answering my questions to providing resources, advice and recipes, they truly want to help me achieve optimum health. And without their support, I may have never found a lifestyle I truly wanted to adopt and was capable of maintaining. After trying diet after diet with little to no success, I am thrilled to share that the keto diet was the lifestyle change I needed. While I have found success with the keto diet (alongside many others), there are many different diets that can fit your specific needs. And if you find a diet that works for you, stick with it. 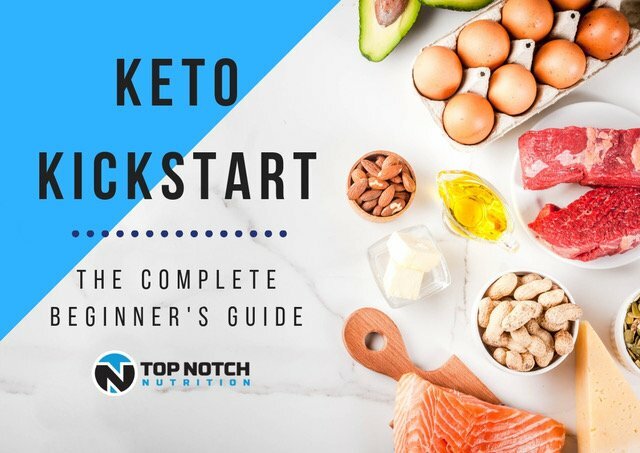 If you want to learn more about the ketogenic diet and how it can help you adopt a healthier, happier lifestyle, check out this detailed step-by-step guide to adopting a keto diet plan.